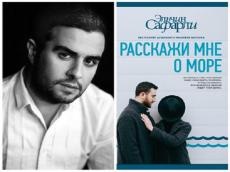 The book "Tell Me About the Sea" by famous Azerbaijani novelist Elchin Safarli has been included in the book fund of Yelabuga Central City Library (Tatarstan, Russia). Safarli's works have gained immense popularity, and their list is already quite large. The author is famous for his amazing and laconic style of writing, the pleasure of reading his books allow you to receive beautiful and touching statements. As the writer himself says, "Tell me about the sea" is a pure and sincere story. There are no negative characters in it. The book is endowed with the love for sea, animals, childhood, people who are near and far away. The book represents a number of separate stories, which are interconnected. All chapters contain certain conventional wisdom about which people are completely forgotten in the constant bustle and stress. Meeting with this novel will allow once again recalling the pleasant moments of life, enjoy the warm nostalgic memories, and get positive emotions, which is so important in the modern world. Elchin Safarli's stories collected in the book are the part of his life, which he shares with readers. He does not try to surprise anyone with fairy-tale adventures, but returns to the best moments of our life - in childhood. Notably, Forbes Russia Magazine included "Tell me about the sea" in Top 20 best-selling novels and collections of 2016. Recognized as a spiritual writer of East, Elchin is the winner of several literary youth competitions. He has published ten novels, written and published in Russian. Elchin Safarli was born in Baku on March 12, 1984. He graduated from the journalistic faculty of the International University of Azerbaijan at UNESCO and devoted himself to television journalism. From the age of 12, he was published in local youth publications. He is the author of the bestsellers "The Sweet Salt of the Bosphorus" and " Enter Without Back ". Thirty-two-year-old novelist is an author of the bestseller "Sweet salt of the Bosphorus" and "There without Back." The novel "Sweet salt of the Bosporus" has earned the approval of the Nobel laureate for literature Orhan Pamuk. Famous Turkish writer, with whom Safarli met at the 11th Congress of the Union of Writers of Azerbaijan presented the first review to the book. "When I talk to this talented young man, I am convinced that the world literature still has a future," Pamuk said. Therefore, the Russian press named him "the youth Orhan Pamuk", and the young author received the title "Discover of the Year" in 2008. In 2011, Safarli produced the short film "Alone with Everyone".